When it comes to happy babies – a balanced routine of feed, play, sleep is a proven winner. So we’ve looked to one of our favourite brands, the impeccable Nook, to highlight four great essentials that will have your baby sleeping soundly. It goes without saying that the cornerstone to great sleep is quality bedding. Coupled with safe swaddling, a firm, safe mattress is the perfect foundation for cosy naps and peaceful nights. When you consider how much time babies sleep (or should be sleeping! ), obviously a magnificent mattress is the business end of this sleeping caper. The Pebble Pure must be one of the most beautiful cot mattresses ever created – but beauty is much more than skin deep when it comes to this essential. Our little babes should be resting their heads on the most natural items possible – and the dual sided Pebble Pure mattress has an organic coconut coir layer, nestled in natural latex. It’s breathable, safe and comfortably firm. The organic interior is encased in organic wool and then covered with an organic cotton and eucalyptus Pebble Mattress Wrap, so your baby feels like they’re sleeping on a cloud. In the early days, this part of the routine will take up a huge slab of your day, so it’s really important to make sure both you and your baby are comfortable and relaxed when feeding. Being comfortable will help your baby latch properly and your milk flow freely – and, of course, you won’t end up with neck and back pain from being hunched over. A feeding pillow is a great way to ensure your posture is perfect and your baby is well supported. The Niche Feeding Pillow is an organic option that’s nice and wide so you can keep using it as your baby gets bigger. But its size doesn’t mean it’s bulky – it’s really light and made from breathable fabric. It also makes a great pillow if you’re a side sleeper, and you can even use it to support your bub as they learn to sit on their own. You have to love a baby product with versatility! As your baby grows, playtime is sure to become one of your favourite times of the day. When your baby is young, playtime will be a few minutes of eye contact, chatting, maybe a song and perhaps some tummy time. As your baby grows, one of the simplest ways to set your baby up for play is with a play mat and play gym. It engages them, and helps their growing gross motor skills as they reach and explore. The Nook Play Package is a thing of beauty, combining the LilyPad Playmat and Finn & Emma Play Gym. 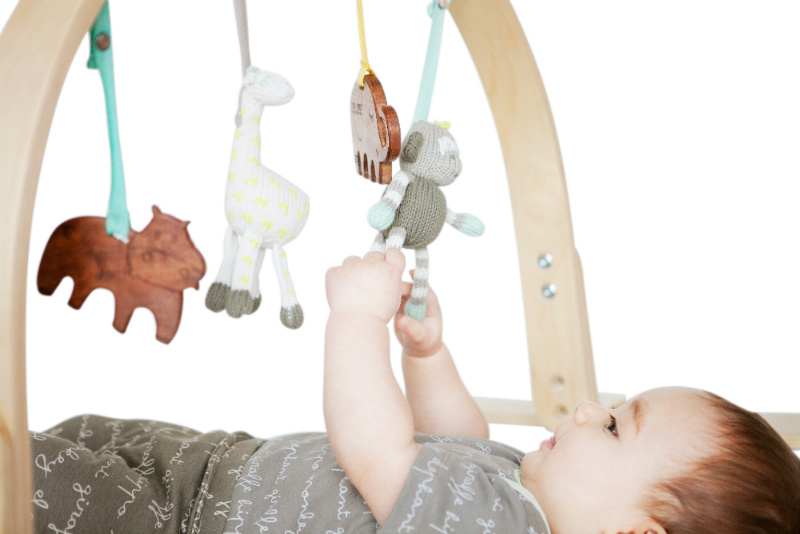 The package gives you the flexibility to choose the colours and toys that will hang from the wood frame. The beautiful, non-toxic wooden and knit toys are simple yet engaging. Remove the play gym, and the mat can be used for tummy time around the home, at the park or the beach. All these lovely Nook products can be found at The Nursery Bird. When it comes to serene slumber for babies, it’s all about consistency and creating a calming routine. Sweet dreams!